I’ve been working on this tutorial course for the past few months and now it’s finally getting ready for release. It will be released in three stages - first the Modeling course in Blender, then the Texturing course in Substance Painter and then the Artwork creation course, coming later this year. The price will be $30 for each and it will be available at my Gumroad page. I can’t wait to deliver this course to you and hopefully, it will teach you everything you need to know about character creation and texturing! Hello friends, welcome to this new tutorial from the Heroes of Bronze series. This time I will show you how to use Adobe Fuse to quickly create and edit semi-detailed CG characters, rig and animate them in Mixamo and then export into Blender, where we apply textures, adjust poses and weights and render them. This tutorial is especially useful if you know little about animation, but want to fill your 3D scenes with animated characters. This tutorial is a preparation for my Spartan course, where I used this technique to create a base model for the Spartan warrior model. This model I’ve been working on for quite some time and now it’s finally almost ready. It is a Spartan warrior wearing a typical composite cuirass (with some not-necessarily historically correct shoulder guards :-), greaves, Corinthian helmet with horsehair crest, the typical hoplite spear and a short sword called kopis. 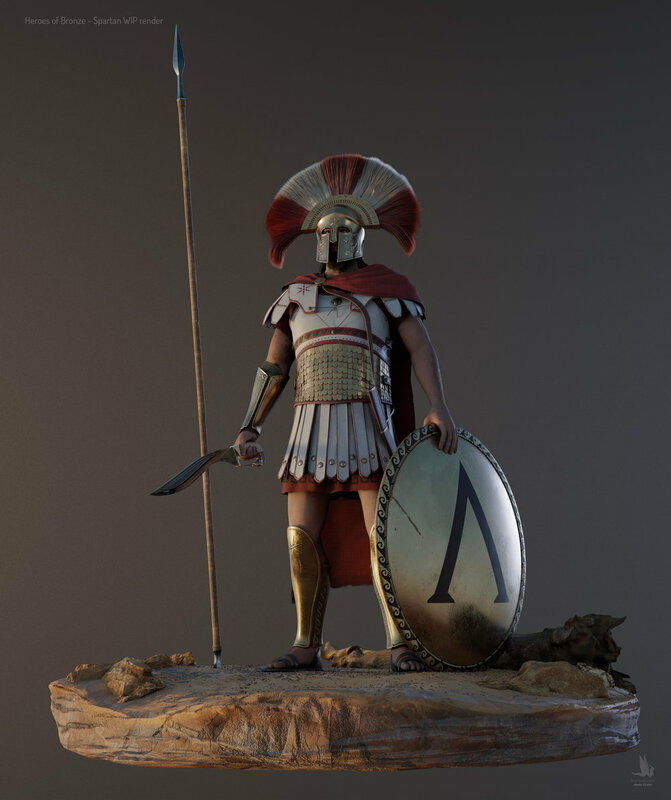 A Spartan warrior, the first production ready character of the whole project. Heroes of Bronze website is live! Hello and welcome to the first post on this brand new site. Here, you’ll be able to find the latest news on the Heroes of Bronze project, as well as some basic info, tutorial links and some ways to support the project, if you like it. My name is Martin Klekner and for last several years I worked on different historical projects. Most importantly, I had the privilege to be the Cinematic Director at the game Kingdom Come: Deliverance. There, I gained a lot of experience in the CG field and decided that I want to create a project of my own. I've always been a fan of three things - Ancient Greece, epic storytelling and learning CG graphics. In this project, I decided to merge all three. Creating my own CG short film project from the Ancient Greek era... and helping YOU by documenting my workflow and giving you tools that will help you create your own CG projects. First,I want to create a short film showcasing the most famous moments of the Ancient Greek history. Thermopylae, Marathon, Salamis, the classical Athenian architecture as well as the majestic trireme battles. Second, I plan to document each step of this project’s creation and regularly release tutorials, showing you my workflow and helping you create your own project! Third, I plan to educate the viewers in a fun form about the world of Greek hoplites, Persian satraps, Mediterranean maritime trade, colonization, slavery, Spartan military prowess, city states, early democracy and much more. This project is situated at around the year 480 BC.